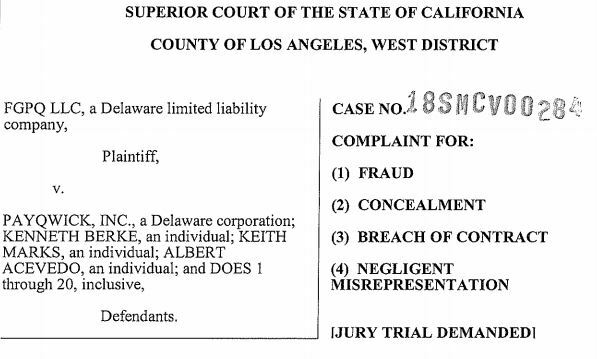 LOS ANGELES, January 23, 2019–(BUSINESS WIRE)–The lawsuit, filed in Los Angeles County Superior Court, alleges that Defendants PayQwick, Inc. and its executive team, consisting of CEO Keith Marks, President Kenneth Berke and CFO Albert Acevedo, defrauded Plaintiff FGPQ LLC. Per the Complaint, PayQwick provides financial services to cash-based cannabis related businesses. PayQwick, through Keith Marks and Kenneth Berke, sought investment into the company from outside investors. Marks and Berke secured a significant investment from Plaintiff by making various representations relating to PayQwick’s ability to imminently facilitate credit and debit card processing services for its cannabis customers, which PayQwick promised would result in significant revenue to PayQwick beginning in the fourth quarter of 2017. The lawsuit alleges that these representations were intentionally false and misleading, as the company has still yet to launch these services to date and appears unable to do so. According to the lawsuit, PayQwick, Berke and Marks also repeatedly violated the terms of the Investors Rights Agreement that governs Defendants’ relationship with Plaintiff. These breaches include providing themselves substantial raises, entering into predatory and self-serving contracts, and representing to Plaintiff and the public that they were in business lines that they were not in. The Complaint further alleges that, consistent with their pattern of unethical behavior throughout the relationship, Defendants engaged in a scheme to defraud Plaintiff into subordinating its substantial investment in PayQwick. Defendants made repeated representations to Plaintiff that PayQwick had finalized an important financial relationship to induce Plaintiff to agree to subordinate its interest to a new investor. Shortly thereafter, Plaintiff discovered that, instead, this important financial relationship had been severed, threatening the financial viability of PayQwick. Defendants deliberately withheld this important information from Plaintiff. The Complaint seeks damages from PayQwick and its officers in their individual capacity. In addition to compensatory damages, punitive damages and attorneys’ fees, Plaintiff seeks to rescind its initial investment into the company, and any consent to subordinate its interest in the company, as Plaintiff was induced to enter into these agreements by fraud and deceit.